Here's a fresh topic to keep pinned so you can easily find what the latest chart rule changes are. This will replace the previous pinned threads which I have put at the bottom of this post as reference. If you have any other questions here is the thread to ask them. Are music video streams now counting towards the official chart? Yes. This seems to be a controversial move as members here are pretty split on the issue of whether they should count, but it has been confirmed that they will count beginning on W/E 12/07/18. This includes official music videos from services such as YouTube, Spotify, Apple Music and Tidal. Unofficial or user-generated content featuring music will not count towards the chart. Is an ad-funded stream worth the same as a premium (paid-for) stream? Not anymore. Also beginning on W/E 12/07/18 there will be new ratios depending on the kind of stream a song is getting. An ad-funded stream will count towards the chart at a standard ratio of 1:600, i.e. 600 ad-funded streams is deemed to be equal to one sale. A 'premium' stream (generated by a user who is paying for a subscription) will count at a standard ratio of 1:100. Is an audio stream worth the same as a video stream? Yes. Audio and video streams will count at the same rate, depending on whether they are premium or ad-funded. How many tracks can an artist have chart at any one time? Three, as a lead artist. The cap was introduced mostly as a response to the controversy surrounding Ed Sheeran having 16 tracks in the top 20 at once. This also applies to soundtrack albums such as 'The Greatest Showman' even though they don't have the same artist(s) on every track. An artist can have as many additional songs chart as possible as a featured artist, or if they are in a group. For example, Kanye West had three solo tracks chart at once, as well as three tracks as being part of Kids See Ghosts. Post Malone also had three solo tracks chart at once whilst being featured on another. This rule has been in place since W/E 13/07/17. What is ACR and when does it happen? To help freshen the chart the OCC introduced the 'accelerated chart ratio' (ACR). This affects the ratio at which its streams are converted into sales. After a song has been in the chart for at least nine weeks, and has been in decline for three weeks in a row, its streaming points are effectively cut in half (its premium ratio will decrease from 1:100 to 1:200, and its ad-funded ratio likewise from 1:600 to 1:1200). A song can therefore be on ACR as early as week ten (though any song older than 3 years is automatically on ACR permanently, regardless of how long it has spent in the chart). A song not on ACR is considered to be on SCR ('standard chart ratio'). This rule has been in place since W/E 13/07/17. [*NEW*] When ACR was first introduced 'decline' was defined as "negative week on week variance of combined sales and streams AND negative variance lower than the market rate of change week on week". However, from W/E 10/01/19 a new rule was introduced where 'decline' is now defined as "negative week on week variance of streams AND negative variance lower than the market streaming rate of change week on week". This means download sales will no longer be a factor in whether a song can 'avoid' ACR, and only streaming data will determine when ACR kicks in for any track. Can a song on ACR get back onto SCR? Yes. A song on ACR can be reset to SCR if it experiences an increase 50% greater than the market change week on week, provided it is within 3 years of its release (any song older than this may not be reset). Note that a song will not be reset on the week it experiences the increase, but the week after. The song also has to re-enter the Top 100 on the week it experiences the increase for it to be reset, and may not be excluded by way of the artist cap. For example, Post Malone's 'rockstar' gained over 50% on the week of his album release, but the song was not part of his top three, therefore it was 'starred out' of the chart, and thus was not reset to SCR. In exceptional circumstances a record label may request a manual reset to SCR. This manual reset is limited to two tracks per artist album, only where the track in question is outside the Top 100 and subject to one week’s notice being given from the releasing label that they wish to implement a manual reset. Manual reset shall be strictly subject to Official Charts and CSC approval. So, what is streaming anyway? Streaming is essentially the transmission of sound through a web network. It can refer to simple audio clips on websites for example, but in the context of this thread, it means playing a song, music video or album through a web service such as Spotify or YouTube. It also now refers to both audio (just the song!) and video (the song and video!) streaming. Where can I stream songs? There are numerous different places to stream music. The main service used for audio streaming is Spotify, which takes up the vast majority of the market. For video streaming, the main service used is YouTube. Other services are Apple Music, Deezer, Tidal, Napster, O2 Tracks, Xbox Music, Google Play, Sony's Music Unlimited and rara, some of which are starting to do video streaming as well but are mostly for audio streaming. Since when did it count to the singles chart? 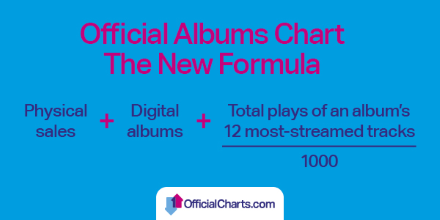 From July 2014, audio streaming has been combined with download and physical sales to make up 'chart sales' which determine the Official Singles Chart. From July 2018, video streaming will also count towards a song's 'chart sales'. What difference does this make to the official chart? Streaming has made a huge impact on the official chart so far, and that's why it's so divisive. Typically speaking, it favours big hits over new songs, which take longer to build up. This means that new songs may be at a disadvantage to enter at #1, or the top 10, and therefore end up with a lower peak. Union J's You Got It All was #1 on sales at the end of 2014, but got knocked down to #2 due to far superior streaming from Ed Sheeran's Thinking Out Loud. This made it the first song to miss #1 despite being the biggest seller of the week. Other songs to have lost out on the top spot due to streaming include Nick Jonas' Jealous, Sigma's Glitterball and Deorro's Five More Hours. The first song to be #1 officially without ever topping the sales chart was Justin Bieber's Sorry, which spent two weeks at #1 in November 2015 but was at #2 behind Adele's Hello on sales both weeks. But wait, can't I just put a song on repeat and help it climb the chart? No, only 10 streams count per user per day on any streaming service. For example, I could listen to Justin Bieber's Love Yourself 20 times on Spotify and 20 times on Apple Music today, but only the first 10 from Spotify and the first 10 from Apple Music will count. On a similar note, you must listen to at least 30 seconds of the song for it to count. You cannot just press play and then skip it 9 further times to total 10 plays! OK, so how does it work for albums then? It's slightly different for albums. Streaming has been included amongst physical and digital sales since February 2015. Firstly, each stream is 0.001 sales this time, meaning that 1 sale is equal to 1000 streams (not 100). This means that sales have even more precedence in the album chart. The top 12 most streamed tracks are taken from the standard edition of an album. The top 2 songs will be downweighted, to the average of the other 10 songs. This is to combat an album being artificially boosted by one or two hit singles. The total of these songs is then added together and divided by 1000 to give a streaming total for the album. 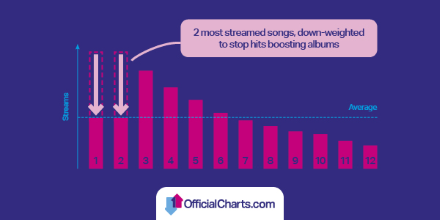 The OCC said of this method: "The reason for the down-weighting is to ensure that if an album features up to two runaway hit singles, streams of these tracks do not skew the performance of their parent album in the Official Albums Chart. Extreme examples of this include huge hits such as Blurred Lines on the Robin Thicke album of the same name, Get Lucky on Daft Punk’s Random Access Memories, All Of Me on John Legend’s album Love In The Future, or Uptown Funk on Mark Ronson’s Uptown Special - but this is also a broader issue affecting many more albums." Otherwise, the same rules apply. Only 10 plays per user per day, and 30 seconds of each track must be heard. Does streaming have a big effect on the album chart? It depends. Certain albums that get little to no streaming will be knocked down considerably in the chart if they've sold very few copies, but an album can still get a good chart position without being particularly streaming friendly. On the other hand, albums by streaming friendly artists will be helped considerably by streaming equivalent sales (this usually benefits hip-hop and rap artists), which could even get them the #1 position over an album that has sold more downloads and CDs. A very timely - and handy - reference tool Dan, that clearly-explains the situation with streaming integration into the main charts clearly and concisely. Only one extremely minor error - it's been announced video streams will count from W/C 6th July, not "W/E" (the W/E date will of course be 12th July). thanks, I had to guess because it wasn't made clear whether 6 July was a week ending date or not. I thought it would start this week but seemingly it'll be next week. Thanks Dan and Joesph for this, very helpful! Do we know if video streaming will have some component towards the album chart (as part of the 12 most-streamed tracks off an album formula) ? The album chart isn't changing apparently! I definitely think that is the right decision in this case. Videos are very much a singles orientated form of music consumption, so not a good representation for how well an album is doing commercially. Really useful thread, I hadn't previously noticed the 12 track rule for albums. Definitely a good thing when you look at albums like Drake's which has double the number of tracks, what would be a huge streaming advantage over acts like Florence, if streams from all tracks contributed. I have a question which I’ve asked before but can never find my answer. Why do some soundtracks count towards the artist album chart and some only count to the compilation chart? Depends if it's recorded by the cast for the film (ie The Greatest Showman, Moana, counts for the albums chart) or if it's just a collection of songs by various artists that aren't in the film (ie Black Panther, Fifty Shades Of Grey, counts for the compilations chart). Basically all the musicals and Disney kids films go to the album chart and the rest don't. based on today's chart update it seems the new rules won't be coming into effect this week then. either that or it's made no noticeable difference. Ah so there is missing YouTube data in the mid update but YouTube is supposedly counting this week, that makes sense. I'm guessing you have to have a Youtube account to count towards the charts? you listen to a song 100 times per day and that will counts on the total sales and plays for a song??? Nope it's capped at 10 plays for each listener so anything after that does not count. Do live recordings count towards the singles chart? For example Jack Savoretti is releasing instant grat Music Too Sad on Friday for his album released in March. The song is a live version from Venice with Kylie. Will it be added to sales of the original single for chart purposes?